This retreat will allow you to combine the best of a relaxing yoga retreat with the revitalizing vibe of the ocean waves of Costa Rica. Enjoy yoga classes and surf lessons at Santa Teresa beach surrounded by a tropical paradise with a view over the treetops out to the endless ocean. Be amazed by beautiful sunsets, spend your mornings or evenings watching the howler monkeys traversing the beautiful vegetation, and explore a unique and adrenaline-filled environment. The accommodation options are private rooms for singles, couples, or groups up to four people. They also have rooms for large groups and families. Please ask for specialized packages for larger groups. All private bungalows have a private bathroom which is partially open to the sky for hot water showers under the sun or stars, small kitchenette, refrigerator, safe box, and wood furnishings. The bungalows are built with an excellent ventilation system and each has a ceiling fan. All beds have orthopedic mattresses. Each private bungalow counts with a private veranda with a hammock where you can enjoy spectacular Pacific sunsets or just listen to the monkeys and birds. The suite offers a spacious room with a king bed, an additional sofa which converts into a queen bed, two fans, safe box, mini refrigerator, large private balcony with hammock, and a private bath with an open sky shower. Spacious room with a king bed , AC, equipped kitchen, safe box, large private balcony with hammock, and a private bath with hot shower. They both have large and small AC apartments. Each apartment comes with a queen bed and an additional single bed, fan, AC, safe box, mini refrigerator, balcony with ocean view, and a private bath with hot shower. They have a large 2 story room with a partially open aired bathroom for hot water showers under the sun or stars, small kitchenette, refrigerator, safe box, lockers, excellent ventilation system and fans. All beds have orthopedic mattresses and there is comfy veranda with a hammock. The other option is a quadruple room with shared bathroom. During this retreat, you will have the opportunity to choose between six yoga classes or aerial silk lessons, so you can decide what’s more suited to your style of holiday. The yoga classes will take place at our beautiful open-air studio in the middle of the jungle. You will also receive four surf lessons, including surfboard rental, rash-guard and fresh water. You will have free time to explore the beach and its surroundings. Funky Monkey Lodge is happy to arrange any extra activity at your request. Delicious breakfast and dinner will also be included in your package at our restaurant on site. Santa Teresa beach is just a four-minute walk from the lodge. It is here where you will find multiple world famous surf breaks. Santa Teresa beach is one of the best and least crowded surf spots in the world. You will have the luxury to choose between the North and the South of the beach. The water is warm all year around and the waves are always consistent and of a good size. Rachel is our sweet and experienced yoga teacher as well as SUP yoga instructor, originally from Virginia, US. She found here love and home in Santa Teresa and decided to share here experience with others. Known for her hands on assists and calming presence, Rachel has been sharing yoga since becoming certified in 2012. Her alignment-based hatha blend classes are comfortably accessible to all levels and help balance both the body and the mind. Nacho, originally from Patagonia, Argentina, came to Costa Rica and fell in love with the beach, nature and life style. He has been surfing and snowboarding since he was a kid. His passion for surf made him to decide to stay in Santa Teresa and form a surf school. Several years ago, he completed a lifeguard rescue course and also obtained surf instructor ISA certification. Apart of surfing he also likes SUP and offers great lessons. He is fun and patient. You will definitively get a green wave during your lesson! A Central American mix between El Salvador and Costa Rica .. both paradises of amazing waves! Aleja has always had an addiction to the sea . She became a surf instructor first and obtained her ISA level 1 and beach lifeguard. She continued studying sports and become a certified fitness trainer, a Crossfit level 1 and a yoga instructor. Now Aleja made a mix of all her passions and experience to create popular SURFIT Training. She is also our surf instructor and power yoga teacher at our lodge. 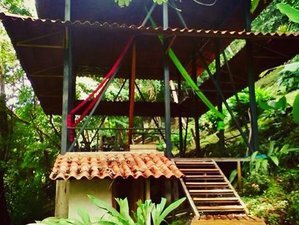 This yoga and surf retreat will take place at the Funky Monkey Lodge in Santa Teresa, Costa Rica. The hotel is located 200 meters away from three top surfing spots at Santa Teresa beach. Santa Teresa and Mal Pais are a pair of towns facing the Pacific Ocean, nestled into the coastal mountains of the Nicoya Peninsula, touching the Cabo Blanco Nature Reserve. The Funky Monkey Lodge is set back from the street for peace and quiet and it is surrounded by a wide variety of animals, particularly monkeys. During this retreat, you will daily be served breakfast and dinner. All meals at Funky Monkey Lodge are specially prepared by the personal chef. Drinks, additional meals and sushi nights (Wednesday and Saturday night) are available at additional costs at the lodge’s restaurant. The restaurant offers international cuisine with vegetarian options. If you like to cook your own food, a fully equipped communal kitchen is available. The closest grocery store is less than a 5 minute walk away. Explore a unique environment with an adrenaline-filled adventure flying through the treetops hundreds of meters in the air with a chance to spot some of the diverse wildlife. During this half day or full day fishing trip, you may catch a yellow fin tuna, dorado, or red snapper. Take a stroll along the seemingly endless white sand beaches or visit nearby national parks such as Cabo Blanco National Park and Cabulla National Park. You’ll see amazing tropical trees and flowers, exotic fruits, monkeys, red foxes, boas, and many birds. Nothing compares to ridding horse along a tropical beach whilst watching the sunset on the horizon. The Funky Monkey Lodge can arrange tours in the jungle, on the beaches, and into the mountains for an additional cost. Enjoy scenic kayaking in the pacific ocean or paddle up the nearby rivers exploring the jungle and its wildlife. Catch fish from your kayak and explore the steamy underwater volcanoes below you during your three-hour tour. Spend your mornings or evenings watching the howler monkeys traversing the beautiful vegetation on the Funky Monkey Lodge grounds. The stand up paddle is an exciting sport as well as a full body workout. You can enjoy an alternative to surfing by using a stand up paddle board. You can drive all over Santa Teresa beach and even take a trip to the nearby Montezuma waterfalls. In Puntarenas board the car ferry to Paquera. After a 30-minute ride, cross the Golf of Nicoya. From Paquera it takes about one hour to get to Mal Pais, Santa Teresa. Please book your flight to arrive at San José International Airport (SJC). Another option is to book your flight to arrive at the domestic airport, Tambor Airport (TMU). Mal Pais, Santa Teresa is located 40 minutes away from there. There are daily flights from San José International Airport (SJC) to Tambor Airport (TMU). There is a direct bus from the San Jose downtown bus station. Usually the bus leaves at 6 a.m. and 2 p.m. from the station. The Funky Monkey Lodge can provide you a detailed travel information about the area. The Funky Monkey Lodge can help you arrange a direct transportation service from San Jose International Airport (SJC) to the lodge and back for an additional cost. Funky Monkey Lodge is located in Santa Teresa, Costa Rica with rustic bungalows and luxury apartments. They offer and create the perfect yoga retreats, surf, or aerial silk holiday for any group.